Underwater Treadmill: Use of an underwater treadmill allows for early intervention and quicker recovery times for post-surgical procedures and other conditions as well. Often, a pet that is injured or in pain may not be able to use a limb on land, but will use it in the water. The warm water increases flexibility, mobility and assists in pain reduction. The speed of the treadmill, the depth of the water and the length of the exercise session can all be controlled to allow for a progressive therapy plan. 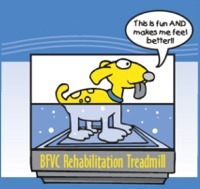 Underwater Treadmill Therapy is one of our main tools in canine rehabilitation. Here is an introduction to the treadmill and its uses. It’s like a regular walking treadmill put inside a fish tank! We walk the dog inside, close and latch the door and then pump water in up to the desired level – usually about elbow or shoulder high. When we start up the treadmill, the dog will naturally start walking. The tank can also be used for swimming small dogs. The water supports the dog’s weight, taking stress off his joints. Walking in water is good exercise without damage to injured or healing tissue. The water is also warm. Like a warm bath or a hot tub it relaxes muscles, increases blood flow to muscles and tissues and reduces pain. What types of cases can benefit? For spinal patients the treadmill can be the difference between walking again or not being able to walk. Carefully placing the feet as the treadmill moves, while the weight of the body is supported by the water, can teach and stimulate dogs to walk. For post-operative orthopedic patients the treadmill provides a way to maintain muscle strength and cardiovascular health while they are unable to walk far on dry ground. Dogs who are able to use a treadmill recover much more quickly after surgery. The treadmill is also great exercise for arthritic pets, especially those that are overweight. Weight loss and conditioning are other uses of the treadmill. When would you not want to use the underwater treadmill? This type of exercise may not be appropriate for dogs with some types of heart and lung diseases, with infections, open/draining surgical wounds or incisions, or with infectious skin conditions. Initial sessions may consist of only a few minutes of treadmill walking. It also takes a few minutes at the beginning and end to fill and drain the tank, and to dry the dog off. Massage, range of motion stretching or gentle walking may be done first as warm-up Treadmill dogexercises, and a little cool-down walking is helpful afterwards as well for dogs that are ambulatory. The less physically fit the pet or the more severe the injury or surgery the dog is recovering from the shorter the session will be. Many owners are surprised at how short the actual walking time can be, but if you’ve ever tried to wade through thigh-deep water or heavy snow you can understand that it’s a lot of work to overcome the resistance of the water. Session length is usually increased by about 10% per week. Fit pets or those using the treadmill for strength and conditioning may walk for 30 minutes or more, but most pets cannot tolerate a very long session at first. The speed of the treadmill should be slow enough for the patient to walk calmly and in a coordinated fashion, without becoming anxious or overtired. For fitness and conditioning we may work up to a speed that lets the dog trot or even run. Although daily sessions would be ideal in many cases, most pet owners try for two to three sessions per week. Less than that is of limited benefit. Most dogs need 6 or more sessions to make significant progress, so most clients purchase a six or ten pack of sessions. Can he still use the treadmill? Most dogs handle it well. They don’t have to actually immerse themselves in water or swim, and the water level rises slowly enough that they generally aren’t frightened by it. The first session for an apprehensive dog may be dedicated more toward getting the pet accustomed to the experience than actual rehabilitation. Treats, toys and praise from the owner usually go a long way toward making it a pleasant experience. Some dogs love the treadmill and others just tolerate it. Very few cannot use it at all. Even some cats will learn to use it! If you are concerned about it, purchase one session to start with. If things go well you can then invest in a package of sessions.